You can see from the images to the right that we operate modern high speed equipment. Combine that with craftsmen that average over 20 years experience and you have The Stuart Company's Cutting and Finishing Division. Our customers are some of the best known companies in the country and they demand the highest quality and fast turnarounds. Our 4 die cutters and 4 gluers give us flexability to handle everything from presentation folders to complex folding cartons. 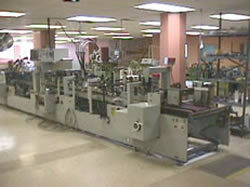 We have equiped our gluers with the latest non-contact qlue systems. 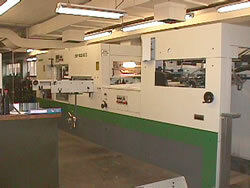 We also have hot melt capability for cartons with demanding coatings.